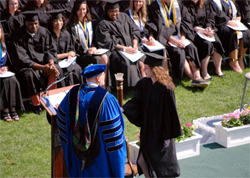 Photos and a DVD of Cazenovia College's 2014 Commencement Ceremony are available for purchase so that you may remember this important day for years to come. Photos taken by professional photographer Gene Gissin include candid images taken throughout the ceremony as well as each graduate receiving his or her diplomas. Photos may be purchased online from Gene Gissin Photography. The DVD, filmed and produced by Visual Technologies, captures the entire Commencement ceremony and may be ordered through the end of June. Visit www.cazenovia.edu/commencement to learn more about purchasing these keepsakes of Cazenovia College's 189th Commencement.